Home → Personal Transformation Strategies → You’re Not As Active As You Think You Are! You’re Not As Active As You Think You Are! Hopefully by now you’ve implemented breakfast into your routine, gotten rid of or reduced your reliance on stimulants for energy, and are ready to embark on your next phase of change. In this third installment of behavioral/lifestyle change, I want to challenge you to move more. I also want to challenge your idea of what it REALLY means to be active and leave you with a sense of how your current efforts measure up. Lack of activity destroys the good condition of every human being, while movement and methodical physical exercise save and preserve it. Doctors now agree that inactivity is a major catalyst for diabetes, high blood pressure, joint damage, chronic fatigue and other major health conditions. I tend to view lack of exercise as a major health condition in and of itself. And is likely the root cause of most of our current health problems. Becoming more active is important but how much is really needed? The CSEP (Canadian Society for Exercise Physiology) recommends 150 minutes of moderate cardiorespiratory activity, or 75 minutes of vigorous activity per week, to experience the health benefits of exercise. These guidelines also recommend 2 weekly weight training sessions to preserve muscle and bone health. But what if you hate exercise? In order to make exercise a lifestyle change, your level of participation must be increased slowly. It also must be enjoyable and garner consistent results, or your efforts will be short term and your experience will be miserable. If you hate exercise, or see it simply as a means to an end, you are probably approaching it in the wrong way. If you believe that exercise is your punishment for “bad behavior” (i.e. eating too much dessert), you’ll likely quit long before making any real progress. This creates an obsessive cycle of binging and punishment that only reinforces your distaste for exercise. To illustrate my point, imagine that you just ate a 600 calorie doughnut. Your guilty conscience now tells you you need to burn that off with a jog tonight. The problem is, you haven’t run in years and never really enjoyed it anyway. So it’s unlikely that you are going to last more than 15 minutes without excessive fatigue symptoms. If you’re a 165 lb woman, you can only expect to burn about 150 calories (at 5 mph) –at best! You’re probably sweating profusely ,experiencing dizziness and discomfort (from the unaccustomed effort) and believe that this is how exercise SHOULD feel. It is, after all, your “punishment” right? All this exertion, yet you’ve only managed to burn less about 1/4 of the doughnut? In fact, it would actually take you close an hour of jogging to incinerate all of the calories. Can’t jog because of joint pain? You would have to walk (at 3.5 mph) for 20 minutes, EVERY DAY for a week, just to burn off that doughnut. Was it worth it? Not likely and for many people, even the recommended 150 minutes of activity each week is not enough to prevent weight gain. In fact, for some overweight individuals, getting as much as 250 to 300 minutes of exercise per week may be necessary to control their weight. So it’s obvious that you’ll need a more appropriate and sustainable approach. You’ll also need to challenge your beliefs surrounding exercise. Painful, intense exercise will NOT lead to lifestyle change. Continued discomfort will discourage you from continuing and can damage your body. High intensity exercise burns more fat. Actually it burns more carbohydrates than fat, at least in the first 15-30 minutes of the exercise. This depletes your muscles and often induces carbohydrate cravings, and a subsequent increase in appetite, in order to replenish lost stores. Engage in activities that you enjoy and that leave you feeling energized, not exhausted. Introduce exercise slowly and micro-progress the intensity as you become more fit. Work at a level that is comfortable, and sustainable over a long period of time. Any other approach that does not adhere to these guidelines will not work for long – I promise you. The key is micro-progression. Adding about 10% to your weekly activity volume until your fitness goal is achieved is ideal. If you can only sustain 15 minutes of moderate activity this week, add 2 minutes next week, and the week after, until you’re burning enough energy to fuel your lifestyle. Most inactive people seriously misjudge how much food they consume and how little exercise they actually do, or are capable of doing. As a 165 lb female, you will burn an average of 12,400 calories each week. Even if you manage to jog for 20 minutes, 3 days a week (a good starting point), you can expect a mere weekly burn of 680 calories. All you need to do is eat 1.3 doughnuts that week to erase the expenditure from the jogging you performed. However, with controlled micro-progression of your exercise duration and intensity, you can soon expect your weekly burn to double, triple or even quadruple – all with the same level of perceived exertion. This makes exercise a more important contributor to your weight management efforts. 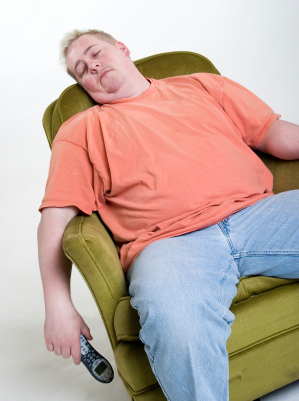 Increasing your activity level is only half the battle, unless you also make an effort to REDUCE your inactivity. This means reducing your time at the computer, in your car and in front of the television. Statistics Canada reports that 48% of Canadians, aged 12 or over, are inactive. Half of them report to be sitting most of the day. 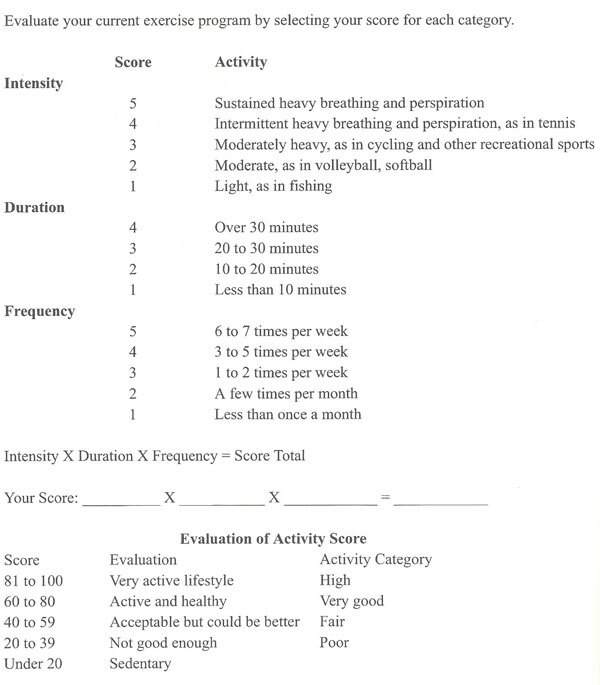 Being physically active does NOT negate the effects of being sedentary( i.e. increased risk of CVD). There is a strong correlation between sitting and mortality risk, even among more fit individuals. So a commitment to frequent movement is essential. If you don’t reduce your inactive time, you’ll soon be complaining that you don’t have time to exercise more. Since you only have 24 hours in the day, limiting unproductive and inactive behaviors will free up the time you need to embrace active living to its fullest. On a related note, a recent study in the British Medical Journal showed that men who watch too much television (20+ hours) produce 50% less sperm than those who watch less. Sperm count, and quality appear to improve relative to activity levels. This is enough to keep me moving that’s for sure! How do you rank? Take the test below to find out! How did you score? Are you as active as you thought? If not, why not start to change that today? You see, athletic activity is 100% reliable and comes with a lifetime guarantee. Each time you work out or play a sport you make a deposit into your bank of health. If you don’t nourish your health you’ll be making deposits into someone else’s account. . . in the form of health care and pharmaceutical costs. It’s an investment of time and energy, but it pays great dividends and unlike the stock market, the return is always greater. Physical activity provides a distraction from the serious side of life. There is no end to activities you can choose from and you can even rotate and change with the seasons, from golf in the summer to skiing in the winter. Just as quick fix diets are going the way of the Dodo bird, so are the quick fix, high intensity approaches to general fitness. I recommend a back to basics approach that is self-paced, enjoyable, and integrated into your lifestyle. It includes weight training ( go here for exercise guidelines for beginners) , aerobic conditioning and mobility work. It also involves lifting things, doing housework, going outside, embracing nature and other means of exercise in lieu of sedentary activities. One by one, you need to replace old habits with new ones that get you moving and keep you moving. With this approach you’ll learn to view exercise as a reward, not a form of punishment. This occurs from the immediate satisfaction of completing the task, and over time through improved health, well-being and quality of life.